The North Carolina State Highway Patrol offered a drivers safety class for students at Central Haywood High School Thursday October 26th. 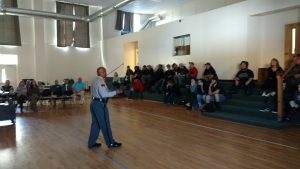 11th and 12 graders took part in a two-part presentation in regards to distracted/impaired driving. They first watched a PowerPoint presentation given by a patrolmen. 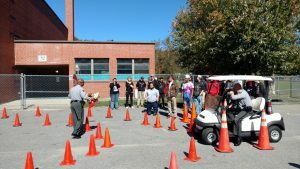 Afterwards, they participated in a driving scenario that simulated the effects of driving distracted/impaired. Cones were set up in the parking lot and students used special goggles while driving a golf cart through the maze.